Founded in 1970, HAMOM is a nonprofit support group made up of and open to all mothers of multiples in Huntsville, Alabama, and surrounding areas. Monthly meetings allow members to coordinate activities, socialize, and share individual experiences. Our meetings often include guest speakers who present a wide range of topics of particular interest to parents of multiples. HAMOM conducts a number of annual projects and events for the benefit of the members and the Huntsville community. We also provide support and advice for expectant mothers of multiples and keep in touch with MOMs at home or in the hospital before and after their multiples are delivered, including meals, babysitting, or simply lending a helping hand. HAMOM meets the third Tuesday of each month at 7:00 p.m. with social time beforehand at 6:30 p.m. Meeting locations vary from meeting rooms at First Baptist Church of Huntsville to local area restaurants. All meeting announcements will include the location. MOMsMart is just around the corner and I don't know about you, but my drawers, closets, and garage are bursting at the seams with items to sell! Let's play a little game of MOMsMart TRUE or FALSE. TRUE or FALSE: Only Moms that have twins, triplets or quads can sell at MOMsMart. FALSE! You do not have to be a Mom of Multiples (MOM) in order to sell at MOMsMart! You might be surprised to learn that you will earn at least 70% on your items that sell, which is one of the highest (if not the highest) percentages you'll find at other Huntsville consignment sales. And selling your items is as easy as tagging, pricing, hanging and then dropping off at the sale. TRUE or FALSE: MOMsMart is only 3 weeks away. It's probably too late to signup to consign. FALSE! The deadline to signup to consign is March 10th, but please don't wait! The sooner you signup, the more time you will have to tag and hang your items. If you wait until March 10th to signup and get your consignor template, the more rushed you'll be to get it all done. TRUE or FALSE: MOMsMart only sells clothing in sets or pairs. FALSE! While many of the consignors are MOMs (Moms of Multiples) the majority of the items are sold as individual pieces or outfits. There will be some items that are hung and priced together if the consignor chooses to sell them as a set, but most items sold separately. So, interested in signing up or have questions about MOMsMart? Email momsmartsale@gmail.com to obtain your template and information packet. Need more information? 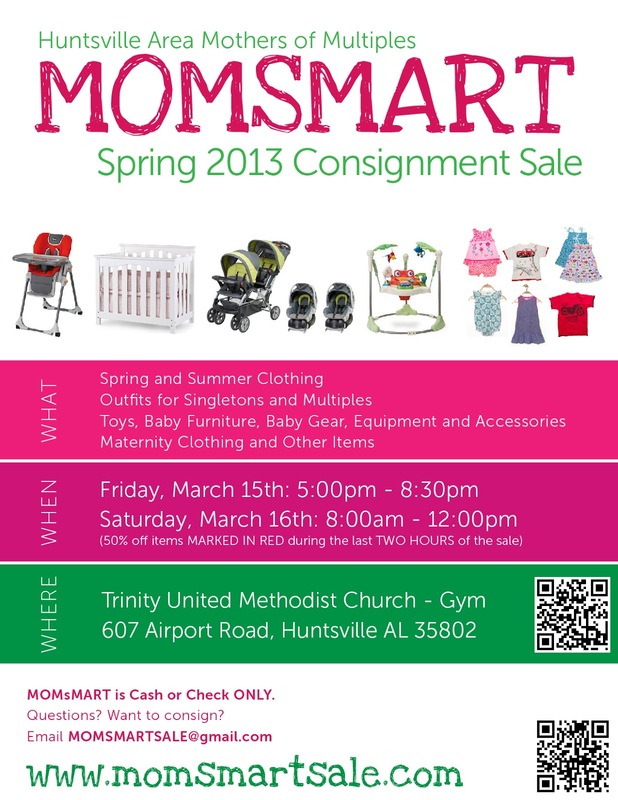 Visit the "MOMsMart" page to be taken to the sale schedule, FAQs, tagging instructions, and much more!